Las tarifas son de $0.50 por trayecto. 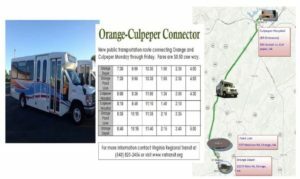 There is a new transportation option between Culpeper and Orange, just 50 cents per ride, thanks to Foothills Area Mobility Service and the Virginia Regional Transit. Go to https://www.vatransit.org/culpeper2.html to check it out!